Hello. I’m Dr. Michael Wald and welcome to my website. If you have persistent or chronic health problems I can help you find natural solutions - I’ve been helping people get well naturally for 30 years. If your health has been declining, and if you are distressed about it, I’m ready to give you my attention, understanding and expertise - The BlooDDetective Way! Dr. Wald explains in 3-minutes how his approach & philosophy fits your needs. Be brief and to the point, but describe how your life has been affected by them. -Why do you think you are sick? (3 points) -Have you spent time trying to get healthy? (3 points) -Have your health problems kept you from living fully? (3 points) -Are you frustrated with other health care providers that you have worked with? (2 points) -Do you feel that you have a hidden illness that no one has found? (4 points) 15 point scale quiz: If your score is equal to or greater than 5 points then Dr. Wald may take you on as a patient. However, if you have a lower score you should also not ignore your symptoms. DISCLAIMER: This quiz is for educational purposes only and is not be be considered as health advice. Thank you for taking a few minutes to email me about your health issues. I am sorry that your quality of life and living has been so affected. I want very much to help. It’s time to make a change, to learn what you need to know to build health and to start living again. I was sick too so I’m highly motivated to help others get healthier than ever. Dr. Michael Wald chats on over 50 health topics of importance for quality of life, disease prevention and longevity. Ask the Blood Detective! This video features Dr. Michael Wald as he is interviewed extensively on the topic of clues to disease "right before your eyes"...that might save your life! GMOs: Researchers debate the safety of genetically modified foods. See what Dr. Wald says - he's the author of Frankenfoods - Dangers of GMOs. Dr. Michael Wald speaking with a distance patient in California. Dr. Wald works in close partnership with you towards developing your natural healing plan. What you do not need is a generalized “one size fits all approach”. Dr. Wald's approach for clarifying your health issues, finding hidden causes of your health problem(s) and natural solutions, has been woven into his carefully designed longevity approach called, The Blood Detective’s Longevity Plan. Dr. Wald believes that developing a Metabolic Map of your entire body by performing specialized health tests (i.e., biomarkers) is a truly holistic way of viewing, appreciating and managing your health concerns. As a concierge practice Dr. Wald is available to you by giving you his personal email and cell phone number. As a paperless office Dr. Wald is concerned about the world environment as it affect our “internal environment”…namely, your health. - No front desk! Dr. Wald wants to manage you every step of the way to help insure your health needs are fully handled. - House calls! If you are too sick or in too much pain to visit Dr. Wald's office he can come to you. Just ask! - Dr. Wald provides chiropractic care and nutritional care for most health conditions that you can think of. 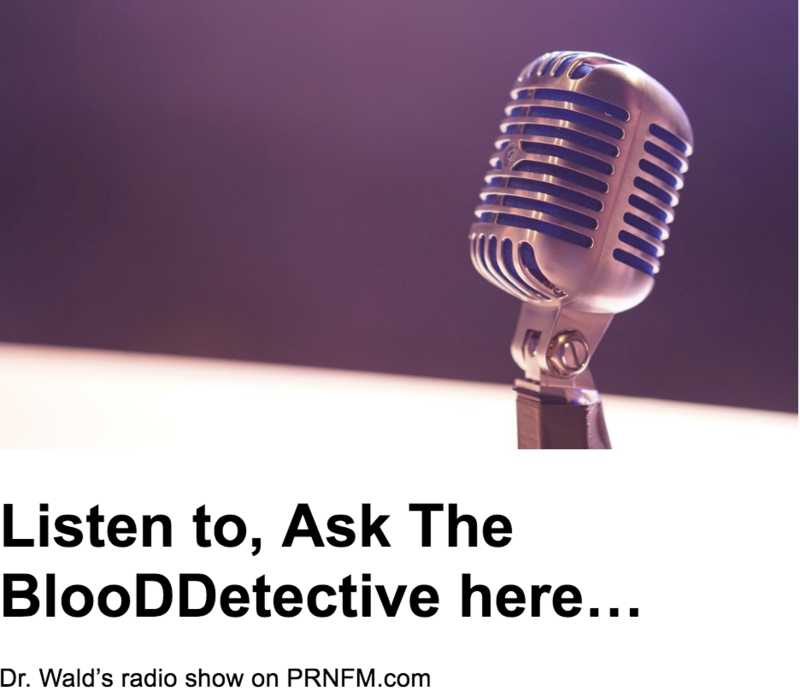 - Host of, "Ask The Blood Detective, radio show on PRNFM.com, Dr. Wald provides you and the public cutting-edge health education and solutions. - Distance Consultations - Dr. Wald can help you nutritionally even if you live far from his office in another state or even another country. Video and phone chats make it easy and worthwhile.